Location in Delhi Dwarka, New Delhi. Vision/Mission Vision-: An acknowledge temple of learning, which generate, create and support positive innovative and competitive learning experience to facilitates outstanding intellectual performance. To serve as an intellectual resource of excellence base in India to excel in education. To be an academic institution of first choice that transforms the face of business world towards betterment . Mission-: Achieving and sustaining Dynamism in providing Exemplary Education, Training, Research, and consultancy. In the field of multi-facet of discipline education by creating and fostering a conclusive live environment to develop the intellectual capacity, critical thinking, creativity and problems solving ability. So that students can compete, sustain and excel in the modern world with great potential and sincerity. 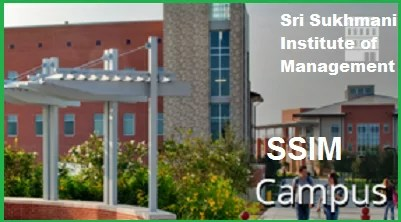 Hence Sri Sukhmani Institute of Management Delhi maintain the standards of excellence in every aspect its operation, and become a role model for newly emerging centres of quality education . Sri Sukhmani Institute of Management Delhi Approvals All India Council for Technical Education (AICTE). Rs 4.50 Lakhs for 2 years. Entrance exams Required CAT/ MAT/ XAT/ CMAT/ GMAT/ATMA. UP/UK-Allahabad, Varanasi, Dehradun, Allahabad, Barielly, Gorakhpur, Lucknow, Kanpur. Madhya Pradesh– Indore, Jabalpur, Bhopal. Punjab – Amritsar, Ludhiana , Chandigarh..
Students need to take any of the MBA Entrance examination Likes CAT/ MAT/ CMAT/ XAT/ ATMA with Minimum Composite score of 500.